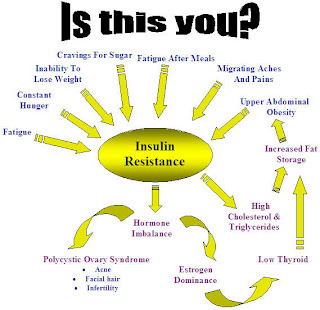 When the cells of human body become lesser sensitive to insulin (hormone secreted by pancreatic gland that helps glucose, derived from food, enter cells to be turned into energy), the state is called insulin resistance or insulin resistance syndrome. In such a situation, pancreas secrets more insulin because the body doesn’t get the signal of having enough of insulin. Excessive release of insulin, in turn leads to undesirable conditions including diabetes, obesity coupled with high cholesterol and heart disease. How Insulin Resistance Causes Diseases? Due to overwork, pancreas gets worn out resulting in lower insulin production in long term. This leads to Type 2 diabetes in about 30% of cases. When the patient suffering from insulin resistance does not develop diabetes, s/he might suffer from abnormal high levels of insulin in the blood referred to as hyperinsulimia (as a result of excessive insulin production.) This often leads to chronic obesity along with high blood pressure, high levels of triglycerides, low HDL (good) cholesterol, heart disease, and possibly some types of cancers. What are the Causes of Insulin Resistance? Causes of insulin resistance vary from diet, cellular, genetic, and other reasons including some medicines and diseases too. Diet- A high carbohydrate diet is often linked to developing of insulin resistance. Many researches have found that higher quantities of fructose (sweetener) change blood lipid profiles, among other things, mostly due to its effects on the function of liver. High amounts of ordinary sucrose or sugar in diet can also develop insulin resistance. Cellular causes- Excessive circulating insulin seems to be contributing to insulin resistance via down-regulation of insulin receptors. This happens because of prolonged and repeated elevations of circulating insulin. Genetic causes- Sharply increased rates of insulin resistance and Type 2 diabetes are present in people with close relatives who have developed Type 2 diabetes. Diseases, Medicines and Other Medical conditions- Some of the recent researches and studies have observed that patients who have had some kind of bariatric surgery (weight loss surgery) have shown increased insulin sensitivity and even remission of Type 2 diabetes. Other studies have shown that glucosamine (often recommended for joint problems) may also cause insulin resistance. Insulin resistance has also been linked to PCOS (polycystic ovary syndrome) as either causing it or being caused by it. What is Insulin Resistance Test? What is Best Insulin Resistance Treatment? It is a controlled balanced diet (insulin resistance diet) and an active lifestyle. If anyone has insulin resistance, his/her blood sugar levels may still be normal. However, it may be on the high side after meals even if the person does not have diabetes. This can be termed as pre-diabetes where such a person is leading a life that is putting a lot of stress on blood sugar control system. Such persons who are predisposed to insulin resistance, or those who suffer from a lesser form of insulin insensitivity must take positive steps for improving insulin sensitivity. Insulin Resistance Diet- Reducing having refined carbohydrates and sugary foods. Increase intake of healthy carbohydrate like whole grains and also fruits, vegetables and beans. Having more of monunsaturated fats, lean protein and lower-fat dairy foods can help improve insulin sensitivity. Physical exercise- Regular physical exercise for about to 30-45 minutes per day is highly recommended for improving insulin sensitivity. Even if one doesn’t lose weight, s/he must exercise regularly to control insulin resistance. Thirty minutes of physical activities three or four times a week can cut insulin levels by 20% while lowering blood sugar levels by 13%. This is enough to take a person from “pre-diabetes” to “normal” conditions. Rest- Sleep disorders and stress, both may cause hormone imbalance. If this is a regular habit (cutting on sleep hours and taking stress), it might lead to diabetes in years to come. A recent study has stated that people who slept for less than 6 hours a night were twice as likely to develop diabetes over the following 15 years compared to people who slept for about 7 hours a night. However, those who slept for more than 8 hours a night were also at a higher risk.